The Stop Motion Studio iPhone, iPod Touch, and iPad app creates videos from your iOS photos with music, audio, and popular photo filters. The great organization and intuitive tools make a fun experience for novices, but the more sophisticated functions tucked into the interface provide excitement for photo and video wonks. The Stop Motion Studio is currently a free download from the iTunes App Store, but you can make cool purchases to upgrade the tools and functions. Honestly, this is definitely a video production iOS app worthy of in-app purchases, and it is vitally necessary to fully access the tools. The free download is pared down significantly, but it does give you a glimpse of what you could have if you ponied up your Starbucks money. A purple down arrow in the upper left hand corner of the home screen opens the store to purchase additional filters and editing tool packages. You can pay $3.99 to purchase all additional tools. Or, you can make individual selections of the exciting tools. You can use your iPhone, iPod Touch, or iPad as a remote camera, import multiple images from your photo library, add drawing and painting, add filters and effects, and more. The home screen is graphically interesting with well-organized tools. The black damask background is unexpected with its throwback to Art Deco theater style. Each video you create is placed in your feed, and you can scroll through them with horizontal swipes. Icons to access additional tools and sharing features are placed at the bottom of the screen. You can play a highlighted video by pressing the play icon. You can share to email, YouTube, and Facebook with a touch. You can also save to Dropbox, iCloud, and your camera roll. You tap the plus icon in the center of the home screen and beginning of your feed to make a video. Chalk scribbled pop-ups help you decipher and use the icons that frame the screen. The upper right hand corner camera icon is your first stop. The in-app camera has nice tools that are accessed with simple taps on icons at the top of the screen like auto focus, automatic exposure, and automatic white balance. When you are finished, you tap the x icon to move back to the editing screen. You can make designations like play as a loop or half speed, as well as adjust to movie speed. You can choose from several themes and effects to add texture and dimension to your movie. The themes and effects are sophisticated, chic, and edgy for those who crave stark contrast and saturation. You can select to fade in from black or fade out, as well as enter credits in the outline to properly frame the beginning and end of your video. The tools to add audio and music are sweet and add nuanced layers to your video. You select the music note icon and your list of purchased music slides on the screen. You select a song, then use a volume style adjustment to designate the part of the song to use. You then touch the microphone icon, and you record any additional audio. The audio and music are layered to add ambience. 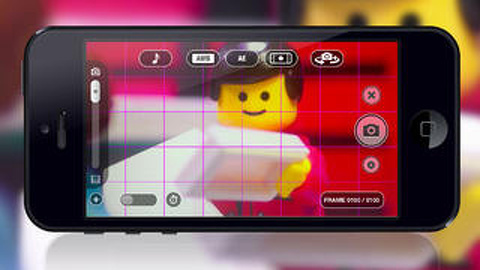 The Stop Motion Studio iPhone, iPod Touch, and iPad app incorporates surprisingly complex video production tools in an accessible, yet highly designed interface. If you don’t snag the free download, go ahead and make the purchase. It’s worth it. AppSafari review of Stop Motion Studio was written by Jenni Ward on October 8th, 2013 and categorized under App Store, iPad apps, Photos, Universal, Utilities, Video. Page viewed 4847 times, 4 so far today. Need help on using these apps? Please read the Help Page. Check out Pixelio-helpfull device with shooting 360 timelapse, video, photo.